Melt butter in a skillet over medium-low heat. Cook and stir orzo pasta until golden brown. Stir in onion and cook until translucent (3-5 minutes), then add garlic and cook for 1 minute. Stir in rice and chicken broth. Increase heat to high and bring to a boil, then reduce to medium-low, cover, and simmer until the rice is tender, and the liquid has been absorbed (20 to 25 minutes). 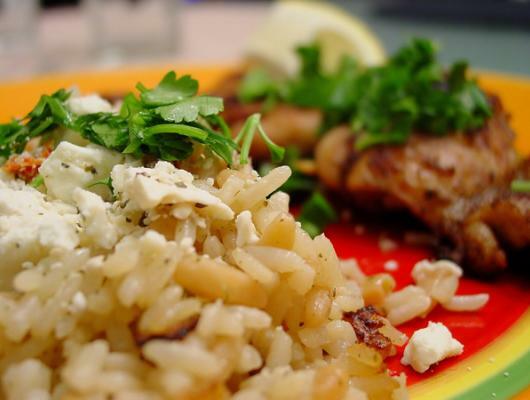 Garnish with crumbled feta and chopped parsley. This looks very tasty. I will have to try this!